"Roller Coaster" is a 9x12"
Adjust the curves, and voila! 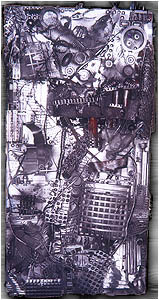 Industrial Agony is a 20x30" collection of industrial and technical debris mounted on canvas. I first amassed all sorts of gadgets and "stuff". The heaviest items were then wired to the canvas, the lighter items hot-glued, or tacked on. The final step was painting it using spray paint, chrome, and final touches of enamel based paint to add a little color to an otherwise monochromatic work. Tip: The glue gun can be used to create some of the textures! Colored spot lights ignite the work at night.The chrome paint reflects the lights creating shadows that add even more dimension and interest to the piece.